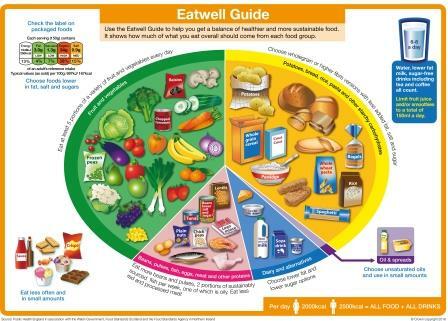 Click here to download a copy of the Public Health England Eatwell Guide. You can use the eatwell guide to help you make healthier choices whenever you're at home deciding what to eat, what to cook or what to shop for out shopping - aim to fill your trolley with a healthy balance of different types of food eating out in a restaurant, café or work canteen, or when you're choosing food ‘on the run' - follow the eatwell guide to help you choose a healthy balance. Change 4 life - tips on making healthy changes just 4 me.